The hotel scene is going micro. From independent hoteliers to big-name chains like Marriott, accommodation providers are taking advantage of the “micro-hotel” trend. Think large communal areas and high-tech offerings that appeal to social travelers, but yes – tiny sleeping spaces. Shrinking size is on the rise. 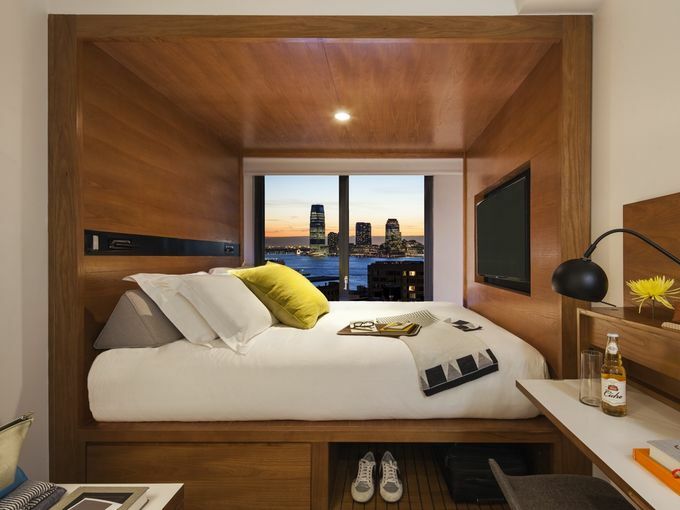 Are micro-hotel rooms the future? “It is a slightly literal example of the ‘living like a local’ trend – where an apartment is often just a place to sleep, and the public spaces are where one spends the majority of their time,” says Gray Shealy, executive director of the Master’s of Hospitality Management Program at Georgetown University. “We are focused on the Millennial-minded consumer, with an emphasis on style, attitude and design at an economical value,” says Vicki Poulos, global brand director for Moxy; Marriott’s brand for millennials. It debuted in September 2014 with the opening of the Moxy Milan. More than 150 properties will be added to the Moxy micro-hotel collection in the next 10 years. Unique communal areas are essential for micro-hotels. So what makes a micro-hotel successful? A small room means a reduced comfort level compared to standard hotels. A micro-hotel still needs to provide value to its guests, and must be priced appropriately for its size. Reduced room rates can make micro-hotels a preferred choice. Millennial-minded consumers place an emphasis on style, attitude and design when determining economical value. Most micro-hotels are designed for people who understand the quality and complexities behind the design of a compact room, The rooms must be very well thought-out, meaning there’s a space to put your bag, there’s a space to put your things, there’s a plug wherever you want to plug in your device. Those who frequent micro-hotels often take advantage of the available technology.